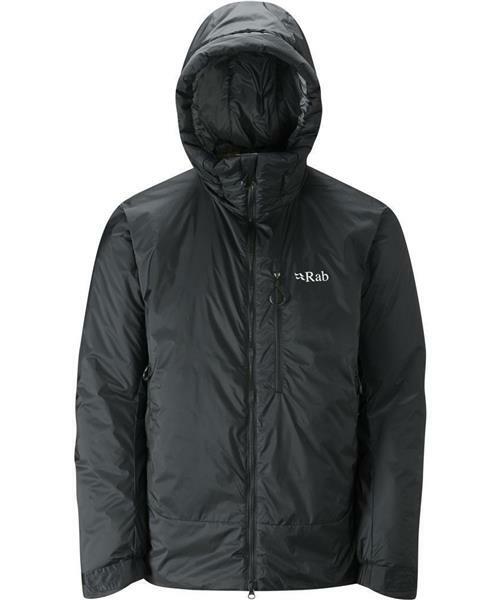 Durable and exceptionally warm, Rab's Photon X is your definitive Scottish winter belay jacket. Ready to take on everything from sub-zero temperatures to bitter, battering winds our Photon X provides shelter in the harshest conditions. Shrugging off rain and snow, the Pertex Endurance outer protects you from the elements while the zoned PrimaLoft Gold Insulation Active inner eliminates any cold spots even when wet. Photon X Jacket - Mens is rated 5.0 out of 5 by 1. Rated 5 out of 5 by Teague from Great jacket Worn this jacket every day lately and I really like it. Im 6'3 230# and I bought an XL, that fits me great. Pretty generous pockets with big pills on them that work ok with gloves (2 outside hand warmers, one left breast pocket, and 2 big mesh drop in pockets inside as well) and the breast pocket holds the stuff sack that comes with it. It shrinks down decently small in the sack and is quite comfy for me in the 0 to -15 C range with light activity (standing around or walking around town). Shock cord on the Hem (left and right) cinch down the waist and one on the hood let's you get a nice comfy fit. Sleeves are good length and pretty big cuff that is Velcro adjustable. Center zip is doubled to allow you to unzip from top or bottom. Next to skin feel is great, the material is soft and comfortable and I frequently wear it with a t shirt. It's another great rab product.